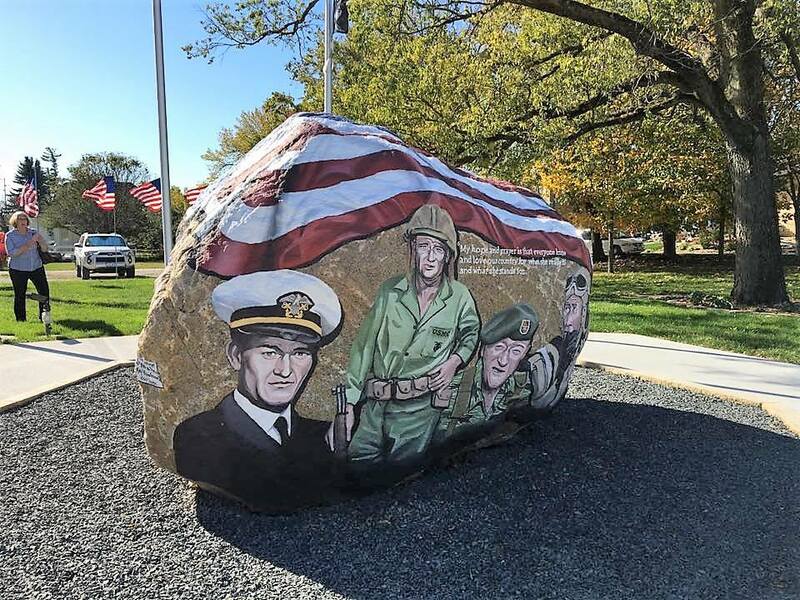 The Madison County Freedom Rock, painted by Bubba Sorensen, is located on the grounds of the John Wayne Birthplace & Museum at the corner of Washington Street and 2nd Street in Winterset. It was finished and dedicated in August of 2017. The Freedom Rock (established in 1999) is a large (approx. 60+ ton) boulder located in rural Iowa that is repainted every year with a different Thank You for our nations Veterans to honor their service to our country. The artist, Ray “Bubba” Sorensen II, was inspired by the movie Saving Private Ryan, as well as, wanting to give Veterans a unique recognition on Memorial Day. Sorensen paints The Freedom Rock on his own with the tremendous support of family and friends. Sorensen is not commissioned to paint the rock but is able to do so each year with the generous help of donations. East side – A female veteran with a Quilt of Valor. The Quilt of Valor Foundation is a group of volunteers throughout the United States who make and then award quilts to any service person. Winterset is the National Headquarters. As of 2017, 8,000 individuals are involved in creating the quilts and over 166,000 quilts have been presented. The female veteran depicted represents the role of women in service to the United States. South side – George Stout and Glenn Martin. George Stout, born in Winterset and a graduate of the University of Iowa and Harvard, served in both WWI and WWII. Because Stout was an art conservation specialist and museum director, he was called upon to lead the U.S. Army unit devoted to recovering art – the Monuments, Fine Arts, and Archives, a.k.a. “The Monuments Men” – stolen from the Nazis. As the Allies marched through France and Germany, he was near the front lines helping to rescue cultural treasures. His expert knowledge of safe transport for works of art was put to the test repeatedly in evacuations of repositories, each time using improvised materials and unskilled labor. Glenn Martin, born in Macksburg, Iowa, grew up fascinated with flight. Martin built his own planes and in 1912 he built an airplane factory in an old Methodist church in Los Angeles, California. In 1916 he merged his company with the original Wright Company, forming the Wright-Martin Aircraft Company. He soon left and founded a second Glenn L. Martin Company in 1917. That company merged with the American-Marietta Corporation in 1961, becoming the Martin Marietta Corporation, and in 1995 merged with the Lockheed Corporation, forming Lockheed Martin, a major U.S. aerospace and defense contractor. His company designed aircraft for the military, including bombers for both world wars. West side – Four local prisoners of war – three during WWII and one from Vietnam – are depicted on this side. They are Carl Hircock of Winterset, Larry Spencer of Earlham, Eddie Benge of Winterset and Don Thomas of Macksburg. They are portrayed in black and white in order to bring to mind the colors and feel of the POW/MIA flag.